This release of the PulseWorx driver now lets you integrate the PulseWorx PIM-R into your ClareHome system. The PulseWorx PIM-R driver uses services and rules to display keypad buttons on the Clare Controls app. Services can contain one or more instructions for PulseWorx compatible devices, such as switches and dimmers. You must install the PulseWorx system before integrating it into ClareHome. This document describes how to integrate a PulseWorx system to work with the ClareHome system. Refer to the manufacturer’s documentation when installing the PulseWorx system. The PulseWorx PIM-R is a UPB (Universal Powerline Bus) interface. The PIM-R is both a UPB transmitter and a UPB receiver giving the ClareHome controller the ability to perform true two-way, powerline communication. When installing a PulseWorx system, you or your technician must use the UPStart Setup Software tool. The UPStart tool is a Windows software application that runs on your PC or laptop and is used to configure all of your PulseWorx devices, including the lighting devices, such as keypads and dimmers. Use it to assign the devices unique IDs and names, enable/disable features and options, link them together, and to assign a password. Once you complete the configuration, you will export a .upe file that you will later import into Fusion. You can download a free copy of the UPStart software from the PulseWorx website. Sometimes a lighting architect or a building contractor will create the .upe lighting file for your specific project. When that person makes the file available to you, download it to your computer so that you can later import and configure the file in your Fusion project. With the PulseWorx PIM-R installed, you can connect it to the ClareHome data network using either of two methods. In the first method, you can connect the PIM-R to the ClareHome network using a SENA LS100 serial device. In the second method, you can connect it directly to the CLIQ device. Which method you choose is entirely up to you. However, each method requires specific hardware configurations and specific configurations in Fusion. The directions for each method follow. In this method, install a SENA LS100 serial device between the PIM-R and the ClareHome data network, as shown in Figure 1. 1. Attach one end of a network cable to a port on the ClareHome data network, and then attach the other end of the cable to the jack on the LS-100. See Figure 1. 2. Using a DB-9 cable (female to male), attach the female end to the LS-100 and the male end to the PIM-R.
3. Configure the LS-100 with the following settings. Note: To configure the SENA LS-100, follow the instructions included with the device. 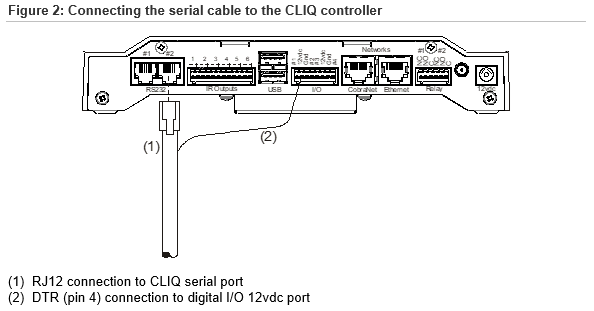 In this method, connect the PIM-R directly to the CLIQ controller using a straight-though serial cable (DB9 to RJ12). However, choosing this method requires that you reconfigure the serial cable. You will need to cut, strip, and reconfigure the cable with a new modular plug using the pinouts listed in Table 2. 1. Cut the RJ12 modular plug off of the serial cable, and then separate and strip the wires. 2. Set the DB9 DTR pin (4) aside. This will not be placed in the RJ12 modular plug. This pin connects to the CLIQ’s Digital I/O ports 12vdc pins (2 or 6). See Figure 3, item 2. 3. Wire the new RJ12 modular plug using the pin layout in Table 2. 4. Snip off any of the unused wires, and then ensure that all of the wires are in the correct pin order. 5. Insert the wires into the modular plug, and then crimp the plug to secure the wires. 7. Connect the DB9 end of the serial cable to the port on the PIM-R.
After installing and configuring your PIM-R device, you must add and configure it in Fusion. To do this, you must import the lighting file created earlier. 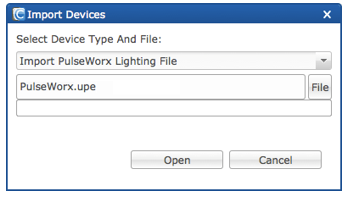 Fusion automatically creates the devices and services for the PulseWorx devices listed in the lighting file. 1. Click the Devices tab, and then click the Import Devices button to display the Import Devices dialog. 2. 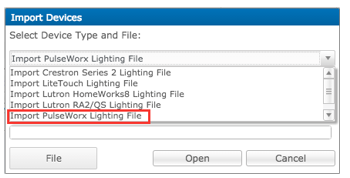 Click the drop-down arrow, and then select Import PulseWorx Lighting File from the list, as shown above. 3. Click the File button, and then browse to the folder containing your lighting file, as shown below. This is the lighting file created by your lighting designer that you downloaded to your computer earlier. Fusion imports the files and automatically configures the devices and services for you. You can edit these devices and services, if you choose. 5. In the Details tab, enter a name for your PIM-R (optional). 6. Next, set the parameters in the Configure tab for Method 1 or Method 2. 1. If you connected the PIM-R using Method 1, click the Configure tab (shown below), and then enter values in the following fields. In the Network Address and Network Port fields, enter the IP address and port number for the SENA LS100 IP-to-serial device. Note: The default port number for the SENA LS100 is 6001. In the Network ID and Password fields, verify the network ID and password of the PulseWorx system that you configured using the UPStart Setup Software. The network ID and password information is entered automatically when you import the .upe file. 2. Click the Save button. 1. If you connected the PIM-R using Method 2, you will need to remove the Network Address and Network Port fields, and then add the additional serial parameters fields. 2. Highlight the Network Address field, and then click the Remove button. 3. Repeat step 2 for the Network Port field. 4. Next, add serial parameters fields that will allow PIM-R to communicate with the CLIQ controller. 5. From the Properties drop down list, choose CLIQ Serial Port, and then click the Add button. 6. 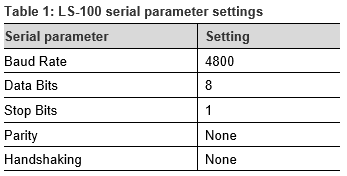 In the Value field, select the serial port number for your device. 7. Repeat steps 5 and 6 for each of following fields. The figure below shows a typical Configure tab with the serial fields and values. The following are known issues in this release of PulseWorx PIM-R.